I began working for my family’s small business as a young teenager which always inspired me to one day have the opportunity to own my own business. 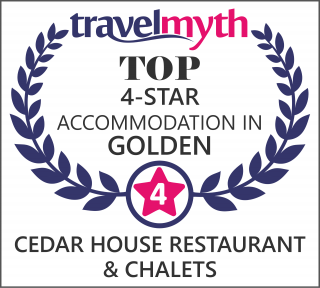 Today, I am the Owner & Operating Manager of the Cedar House Restaurant & Chalets and have been for the past nine years. My experience as a small business owner started in 2008 when I purchased a restaurant and single chalet in the countryside outside of Golden, BC. The excitement of being a business owner coupled with my vision of the potential of the property, kept me fuelled for the long days ahead. I started work every day at 6 am and closed the restaurant by 11:00 pm and was lucky to get everything cleaned up in time to be in bed by 12:30 am to start it all again the next morning. I was the owner, manager, prep cook, shuttle driver, server and dishwasher. I was also the chalet office manager and the housekeeper for the chalet in the mornings after guests checked out. It wasn’t long until I realized I needed more hands on deck! Having more staff allowed me the time and opportunity to start expanding the business and build 6 more chalets over the next 5 years. Construction has always been a passion of mine and with the help of a good friend we spent evenings dreaming up the next chalet and making the floor plans on a bar napkin at the local pub! We enlisted the help of local trades persons but the majority of the work was with my own two hands and an eye for the details. Today I am still very much involved in the day to day operations but focusing mainly on the landscaping and maintenance of the chalets. So the hours aren’t nearly as long as in the beginning! It is quite remarkable when I look at what I have accomplished over the last decade. I take a lot of pride in what I have created and I have a team behind me that has become like family. I have a huge amount of gratitude for those who supported me along the way, believed in my vision and helped me realize my dream.